Demetrius' elite Leukaspides troops desert, and then celebrate Pyrrhus of Epirus as the new King of Macedon, 288 BC. The Army of Pyrrhus of Epirus 300 B.C. - 272 B.C. Pyrrhus was born a Prince of the Molossians- the ruling class of Epirus which traced it's lineage to the age of Achilles. (But who didnt back then!) Thrown out of his Kingdom, Pyrrhus learned warcraft from none other than Antigonus Monopthalmus and was one of his Lieutenants at the decisive battle at Ipsus. (Pyrrhus apparently aquitted himself well even in this disasterous defeat for Antigonus and his brood). Pyrrhus then received aid from Ptolemy Keraunos in the form of Phalangites, money, and ships to retake his crown in Epirus. He re-established his dynasty and began recruiting a Macedonian style army from the peoples in his domain. When Roman pressures on Southern Italy squeezed Tarentum this city appealed to Pyrrhus for aid (the same as they had done with his predecessor, Alexander of Epirus, who campaigned in Italy while Alexander of Macedon conquered Persia, prompting his Epirote cousin to deride these "Victories over women, while I fight men!" Some of these men eventually assassinated the Epirote when his ambitions alarmed his employers). Pyrrhus undertook the crossing to Italy with his professional army and soon became embroiled with the reformed Roman Manipular Legions who had for the last forty years been avenging their disaster at the Caudine forks by knocking about all opposition in Italy. When Pyrrhus first saw these Legions he declared "This is not the order of Barbarians!" The battles that ensued were the first titanic clashes between the Phalanx and Roman Legions, at first the Hellenistic professional army won bitter "Pyrrhic" victories, mainly due to their "Lucanian Oxen" (War Elephants. The ensuing attrition and stalemate sent the ever impatient Pyrrhus on an crusade to capture Sicily from the Carthaginians. But he was thwarted in this venture by an alliance between Rome and Carthage, and having his fleet wrecked, he returned to attempt a final conflict with Rome. Ultimately the ceaseless pressure of Roman armies forced him out of Italy for good. Unflappable, Pyrrhus returned with the remnants of his army and captured the Macedonian Throne, and again lost it. Finally he tried to conquer the Pelopponese and Sparta, but was killed in street fighting in Argos, when elephants got stuck in the gates and blocked his assault, the locals recovered and an Argive woman felled him with a tile from a rooftop. This list may be used to create an Epirote army for campaigns in the west vs. Romans or Carthaginians. Some units marked with * were only available in Pyrrhus' Western Campaigns, and may not be included if any units marked ** are used and vice versa. Richard Evers has been having fun with this Army list! He has graciously built Army Builder lists that allow Pyrrhus' armies to be built from the folowing army list. The list are split into two scenarios, Eastern (Greek and Macedonian campaigns), and Western (Italy and Sicily campaigns). The Samnite file is based on Allen Curtis' proposed army list from the upcoming Warhammer Punic Wars supplement. Characters: Pyrrhus of Epirus must be the General. It may have an Army Standard Bearer. Characters may not total more than 25% of the army. Cavalry: Up to 20% of the points value of the army. Phalanx: At least 25% of the points value of the army. The army must contain one at least unit from this category. Special Troops and Allies: Up to 50% of the points value of the army. One Elephant may be taken for each 1000 pts. in the army, however, at least one elephant must always be taken. The minimum size for a regiment is five infantry models. There is no upper limit. One model in each unit may be upgraded to Leader (+5 points), Standard Bearer (+5 points), and Musician (+5 points). Use the rules form AtG page 6. See AtG pages 4 and 5. 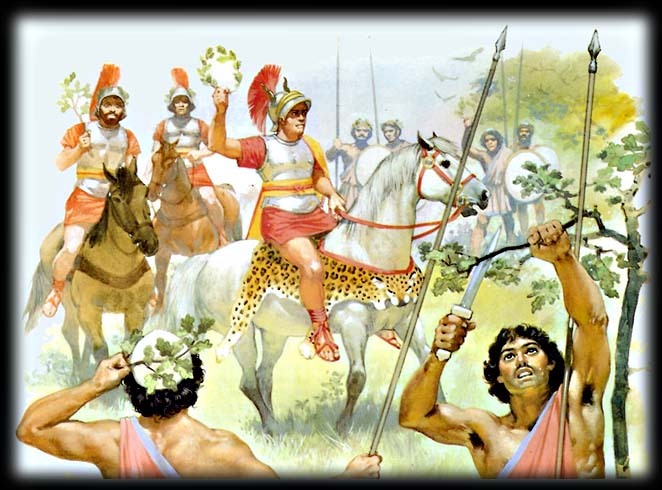 Pyrrhus's Chaeonian Guards were capable of maneuvers that resembled Alexander's Hypapsists. (Athough in Pyrrhus's army Hypaspist was a title that applied to his Hetairoi or cadre of staff officers). If you think that they were'nt actual "Hypaspists" then treat them as "souped up" Macedonian Phalangites instead. The Chaeonians may be armed with Pikes, or thrusting spears and javelins. In either case, the they may form into either a phalanx (if they have 16 models or more) or may form into looser light infantry formations, and may change their "style" by reforming. If they form into a phalanx then they lose -1 inch of movement. If they are armed with javelins they may even skirmish! Chaeonians with heavy armor may not skirmish. Note: if the Chaeonians break down into light infantry they may not reform into phalanx for the duration of the game. If the Conscript Phalanx "March moves" or charges it may only do so straight ahead, no wheeling allowed, it may however adjust 1" to the right exactly the same as Greek Hoplite Phalanx. The Tarentine cavalry became the most sought after types of light cavalry when introduced during the wars of the Successors. Pyrrhus knew first hand of their skills because they served with Antigonus, his benefactor. The main thing that Tarentines did different was to use a shield on horseback, but they also developed tactics that made them somewhat slippery to deal with. Later many Hellenistic cavalry began to adopt shields and lose their Xystons. Tarentine cavalry carry a large but not metal reinforced shield (certainly not a hefty Hoplon)- so for the sake of clarity they are regarded as carrying Medium shields. A Medium shield allows a +2 save vs. missiles and +1 vs. hand to hand casualties. Tarentine cavalry may use the PARTHIAN SHOT special rules. 1- The night march is successful, the Guard unit may deploy on any table edge (except 12" from the enemy baseline) along with one elephant (added to the night march from the army's list if present). They may not be placed within 8" of any enemy unit. 2- The Chaeonians lose their way but may be set up anywhere on the table outside the enemy deployment zone as long as no enemy unit is able to see them, and they are not placed within 8" of an enemy unit. If there is no place to hide them then they deploy normally in the Epirote deployment zone. 3- The night march is confused, the Chaonian guard enters on a table edge (except the enemy baseline) starting on turn two. Which table edge is determined by another dice throw: 1-3 the unit arrives on the left table edge, 4-6 on the right table edge but in all cases they must be further than 8" from any enemy unit to deploy, and they must not deploy within 12" of the enmy player's table edge. 4- Lost in the dark, re-roll on this chart again but add 1 to the die roll. 5- Lost and with no reliable guides, the Chaonians are turned back and arrive on the Epirote baseline table edge on turn one. 6- The night march is a disaster, the Chaonians are lost in the dark and stumble onto the enemy camp, they lose half their number and are placed on the Epirote baseline, on the first turn they count as "rallying", and may not move or shoot. One enemy unit of equal size must also be withdrawn to their table edge, as it is these troops that repelled the sneak attack! The Rhodians and other famous slingers used cast lead sling bullets instead of stones. This plus their natural skills at using the sling made them sought after mercenaries , although they were never very numerous. Expert Slingers do not suffer the -1 penalty for long range. Expert Slinger units may not exceed the size of the smallest skirmisher unit in the army. (Example: if an army had three units of skirmishers, one of 12, one of 8, and one of 10 models, the Expert Slinger unit could have 5-8 models maximum). Equipment: Sword. May have light armour at +3 pts, heavy armour at +4 pts, shield or buckler at +1 pt, large shield at +2 pts, Xyston at +3 pts (adds +1 Initiative), pike or kontos at +4 pts. May ride a warhorse at + 4 pts. May not have shield if mounted and using a Xyston. Special Rules: Army General. STUBBORN. Pyrrhus is a "Warrior of Legend" and may re-roll one failed to hit roll, and one failed saving throw per turn. Subordinate Commander's were capable leaders that can inspire troops when the General is away! Equipment: Sword. May have light armour at +3 pts, heavy armour at +4 pts, shield or buckler at +1 pt, large shield at +2 pts. May ride a warhorse at + 4 pts, or regular horse (free). May not have shield if mounted and using a Xyston. Special Rules: Army Standard Bearer. Equipment: Armed with sword, Light Armor and Xyston (thrusting spear). Any unit may substitute throwing spears,javelins and shields for Xyston (lose -1 Initiative). Any unit may upgrade to heavy armor at +2 pts. Special Rules: Xyston. Agema may fight in Wedge, Thessalians may fight in Wedge,or Rhomboid formation, or even as light cavalry if not upgraded to heavy armor. Agema are STUBBORN. Equipment:Armed with swords, and javelins. May have peltas (bucklers) +1 pt. or Medium shields at +2pts. Equipment: Armed with sword, pike, light armour and shield. May upgrade to Heavy armour at +1 pt. May substitute javelins and thrusting spear for pikes for free. Special Rules: HYPASPISTS. Chaeonians are Stubborn. The Chaeonians may use Night March. Equipment: Armed with sword, pike, light armour and shield. May replace light armour with heavy armour at +1 pt. Special Rules: May fight in MACEDONIAN PHALANX formation (see above). Macedonians are Stubborn. (One Epirote phalanx regiment must be taken for each Macedonian phalanx regiment in the army). Equipment: Armed with Hand weapon, javelins, Pelta (bucklers). May replace Pelta with shield +1. Special Rules: Light infantry. Aitolians may use Feigned Flight tactics. Special Rules: Skirmishers. Rhodians are Expert Slingers. Equipment: Tarentines/Italiotes are armed as Hoplites, they wear light armor, large shields, and thrusting spears, they may not carry standards. Or they may be fielded as CONSCRIPT PHALANX. They can upgrade to Heavy Armour at +1 pt. Special Rules: Phalanx- or Conscript Phalanx. Tarentines are LEVIES and fear any enemy unit they don't outnumber bya at least 2:1. Equipment: Armed with hand weapons, javelins, and Medium Shield (+2save vs. missiles, +1 vs. hth). Special Rules: Skirmishers, Parthian shot. Any units are allowed from the following lists as allies. Samnites*, Italiote Greeks*, Siciliotes*, Campanians*, Apulians*, Oscans* from the "Punic Wars" army lists. Pyrrhus used many Galatian troops in his bid to capture the throne of Macedon in his later Campaigns. He may take the following 0-1 Fanatic warband, Warband infantry, Light cavalry, and up to one Chieftain per 500 points of Galatians. Opposing Greek Hoplites and Macedonian Phalangites "hate" the Galatians in Pyrrhus' army- because of all the looting of burial mounds! Greeks ** No Sacred bands, or Spartans allowed, and Thessalians will not ally in an army that contains Galatians! Equipment: The mahout is armed with javelins and hand weapon. Two Crewmen are armed with javelins and wear light armour, all crew carry shields which are hung on the outside of the Howdah. Special Rules: ELEPHANTS. One Elephant must be taken by this army! Equipment: : Each machine has a crew of 2-3 men armed with swords. The crew may have light armour at +2 pts per crewman. Special Rules: No more than one artillery piece per infantry unit in army, Stone throwers may only be used in Sieges. Bolt Thrower: Range = 48", Strength = 5/-1 per rank, no save, D4 wounds per hit. Stone Thrower: Range = 48", Strength = 7, no save, D3 wounds per hit.